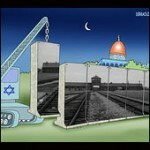 Is a Second Holocaust Coming? The Israeli atomic-weapons program produces an estimated ninety pounds of plutonium a year, enough for a hundred Hiroshima-sized warheads! Because of Israel’s size, her potential Arab adversaries need not be so ambitious. Only five nuclear bombs detonated over major Israeli cities would be enough to immediately kill 60 percent of the population; most of those remaining would be exterminated by fallout. 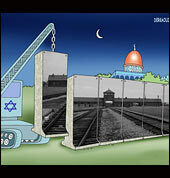 The Jewish nation, finding itself placed in a new atomic oven, will not go submissively into that second Holocaust. She will fly her own nuclear bombers like a miniature superpower. The Jews will face another threat of the Holocaust with their own regional version of the Third World’s War. For a long time there will be disharmony in the Mideast, until at last Israel faces up to the terrible truth that it is not always right and others always wrong. They have been termed the Chosen People, but are they more chosen than those who themselves choose God?…It would be ridiculous to say that the Mideast crisis will pass until the hearts of men are uplifted. The smoldering fire remains until man himself alters his consciousness and overcomes hatred and greed. On that day I will give Gog a burial place in Israel, in the valley of those who travel toward the Sea. It will block the way of travelers because Gog and all his hordes will be buried there. So it will be called the Valley of Hamon Gog. At the same time when Gog shall come against the land of Israel…there shall be a great shaking in the land…and all the men that are upon the face of the Earth shall shake at my presence…and every wall shall fall to the ground…. At the time of the end the king of the South [bloc?] will engage him [the Antichrist] in battle, and the king of the North [bloc?] will storm out against him….He will invade [and]…extend his power over many countries: Egypt will not escape….The Libyans and Nubians [Sudan] in submission….He will set out in a great rage to destroy and annihilate many….Yet he will come to his end and no one will help him [international boycott? ]….There will be a time of distress such as has not happened from the beginning of nations until then. But at that time your people [Israel]…will be delivered. But your many enemies will become like fine dust, the ruthless hordes like blown chaff. Suddenly, in an instant, the Lord Almighty will come with thunder and earthquake and great noise, with windstorm and tempest and flames of a devouring fire. Then all the hordes of all the nations that fight against Ariel [situated in the currently disputed West Bank], that attack her and her fortress and besiege her, will be as it is with a dream….As when a thirsty man dreams that he is drinking, but he awakens faint, with thirst unquenched [an allusion to water running out in the Mideast?] So will it be with all the hordes of all the nations that fight against Mount Zion. The Prophets Ezekiel and Daniel allude to a distant future war between the northern developed nations (Northern Bloc) and the developing southern Islamic nations (Southern Bloc) hinging on a future kingdom of Israel reborn, the consequences of which shatter every wall and building on earth. Is this prophetic hyperbole, or does a conflict between Arabs, Persians and Israelis lead to a resumption of US and Russian hair trigger tensions tripping a thermonuclear war? The famous prophecy of Nostradamus (10 Q72) has another code up its wizard’s sleeve to indicate a date. Reverse the numbers of the year 1999 and you get 9-11-1. The words Sept mois in French can translate in Nostradamus’ nebulous poetry to read “seven months” or “seventh month.” In other words, the old seventh month of earlier calendar reckoning called Sept-ember (September). So the line can read: “The great king of terror descends from the skies on 9-11-1, September.” We therefore have with the falling twin towers of New York brought down from terrorists coming out of the skies in hijacked civilian jet airliners, the “Pearl Harbor” event of World War III. We are in the first years of a 27-year world war of terror and counter-terrorism. So far Syria as not faced an allied coalition invasion though it might soon if there is a war with its Iranian ally, but my premonitions of such an invasion happening to Iraq, and the disaster that would cause were already finding their confession in the passage above from The Millennium Book of Prophecy published in 1994. Nostradamus put great prophetic emphasis on oil and the Arab-Israeli Six Day War. The conflict established the current battle lines between Arabs and Jews over land in Palestine. Today’s troubles in the region resonate as another 40 year karmic echo of lessons unlearned and problems unresolved between Israeli and Arab, or better, Jews, their Christian supporters and the Islamic world. They are ready again to fight over disputed Palestinian lands. The peacemakers must understand that all conflicts and civil strife in Iraq, Lebanon, the Palestinian territories and a looming future war in Iran are bitter fruits off the same poisoned vine, the Palestinian problem. Every vine has its roots. A more fundamental source of conflict in the Middle East may fault Israel itself. The chosen have a choice between war and peace in the near future. Forty years ago, it may have been right to preempt a threat of invasion in the Six Day War of 1967. Perhaps in 2007, the lesson in karmic echo is “not” to preempt an attack on Iran. I believe the spirit guides of Ruth Montgomery have a message for the Israeli people. Choose another way to be Chosen. The conceit of a master race mind-set lurks in the collective unconscious of all peoples who think they are Chosen. Even the righteous can be wrong. It will be seen in the future that a more spiritually balanced humanity has broken out of such mindsets through the practice of a new science of Self-Observation. They will understand what is chosen is not a people or a race over others but a “choice” to be conscious and loving. The people of tomorrow choose to be compassionate with their neighbors. They will love themselves so much that they will stand against any bellicose threat, yet they will equally love their potential enemy so much not to precipitate war. They can do this because they no longer live as slaves of unconscious fears nor burden themselves with the hubris of being chosen people. All human beings are the chosen of God. In my next bulletin, I will share excerpts from my new book, Nostradamus Iran predictions, that expose how a Second Holocaust of the Jews may not be an imminent threat, but a self-fulfilling projection of false anticipation. It can be avoided completely. This entry was posted in Geo Politics, Middle East and tagged A World Before, antichrist, Baal Hammon, bible prophecies, Bush, Daniel, Ezekiel, Hammon Gog, Iran, Israel, Nostradamus, prediction, predictions, prophecy, Ruth Montgomery, Second Holocaust, Six Day War, war with Iran. Bookmark the permalink. Post a comment or leave a trackback: Trackback URL.